Making Panettone has been on my “bucket list” for the last few years. It is a rich Italian bread that is made with eggs, candied citrus peel, and butter and typically eaten at Christmas. Dutiful-son always seems to devour the store-bought panettone, so this year I thought I’d’ make this delicious Italian Christmas bread for him. Now before you scroll down and “exit” because this bread looks too difficult…..just hear me out. Listen……..you can make this bread. Don’t get intimidated because the dough has to rise a few times. As well, don’t call it quits because the bread seems like an “all day affair”. It really isn’t. It’s just that the dough needs to rise a few times and that takes a few hours each time. You don’t have to do anything during these “rise” times so go put your feet up and have a cup of tea or coffee and read a book. Better still, go for a walk, call a friend or whatever. The point that I’m trying to make is that you don’t need to be intimidated by these “specialty breads” because they need “rise time”. They just require “pockets” of attention throughout your day. They do not require your day! So……………………lets get started! If you’re not familiar with making a sponge….DON’T PANIC. It’s really EASY! All you’re going to do is combine the warm water, sugar, salt, and yeast in a small bowl. 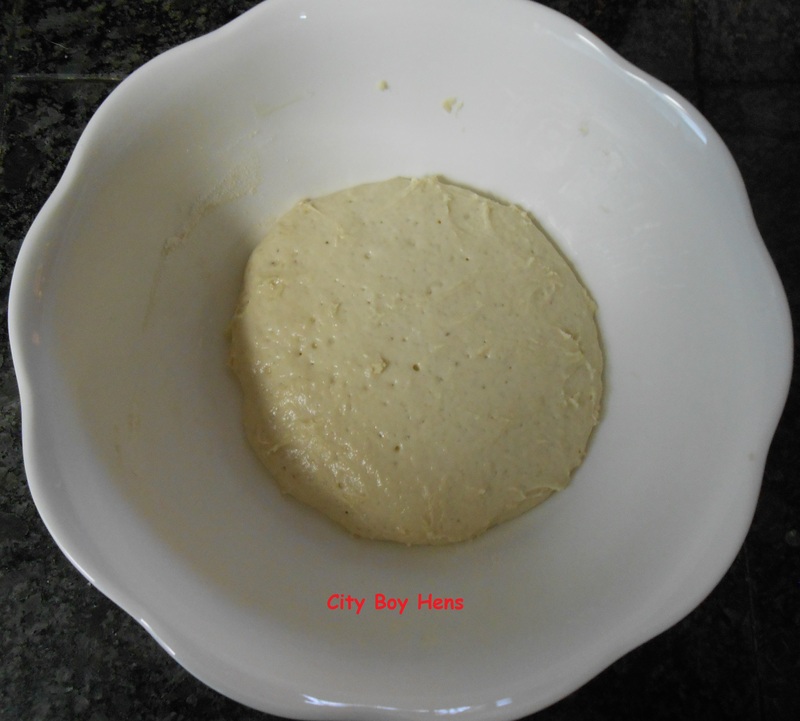 Stir it up and leave it for around 10 minutes in order to let the yeast dissolve. Next, stir in the flour. It will end up feeling pretty sticky and looking like the picture below. Now, cover the bowl with some plastic wrap and let it rise in a warm place until doubled in size (around 2 hours). I use my oven for the warm place. I find turning it on for a minute or two and continuing to keep the oven light on creates enough warmth for the rise. Okay….now you have 2 hours to wait. Go get that cup of tea/coffee and take a rest with a good book. See ya’ in a few hours! Mix together sugar and butter in a large bowl. Now add your eggs and egg yolks. 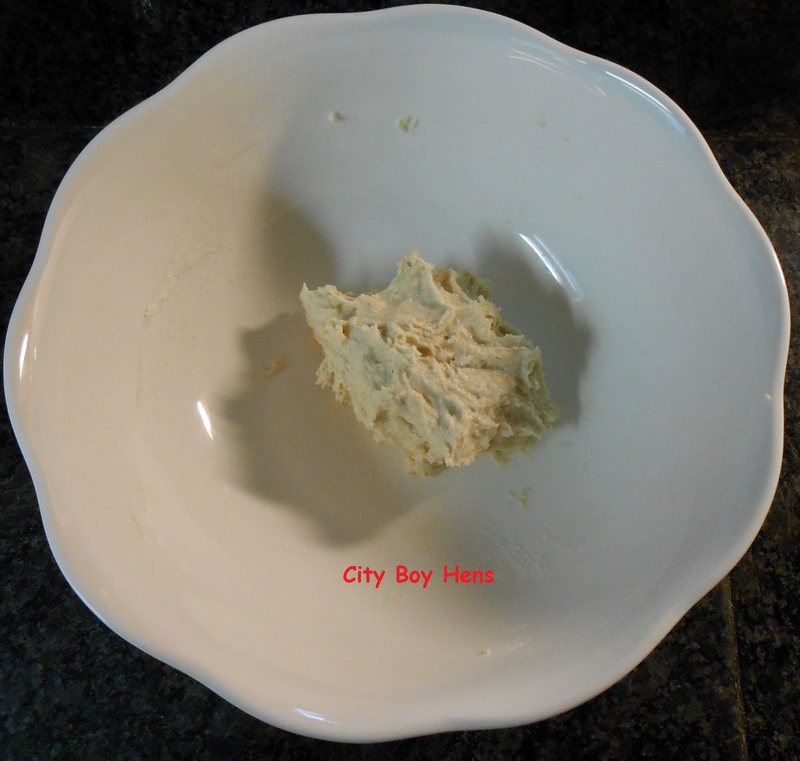 Beat the dough until it is thoroughly mixed. Add sponge, warm milk, and vanilla. Stir until well mixed. 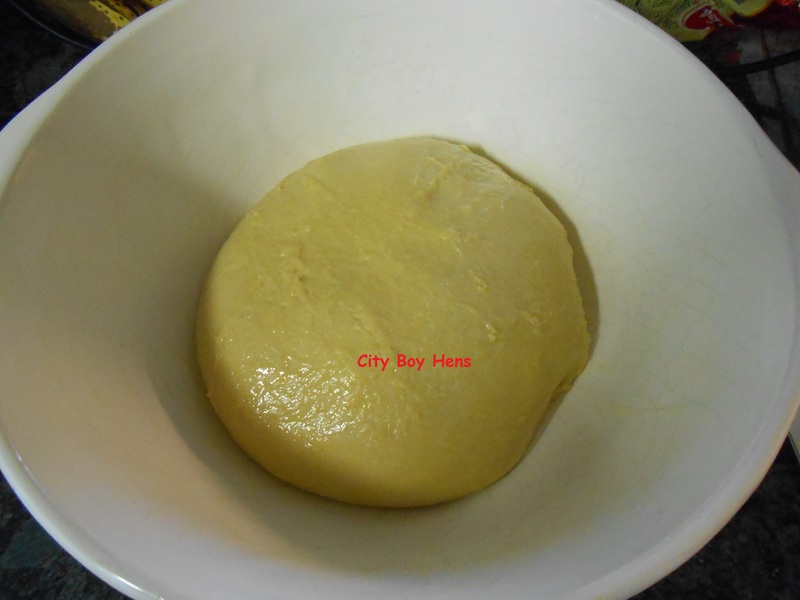 Add the flour (1 cup at a time) until well mixed and a soft dough is formed. Now begin to knead your dough on a lightly floured surface or in your stand mixer. If you are kneading by hand, it should be around 8 minutes. Make sure to add a bit more flour if the dough is too sticky. If you are using a stand mixer, make sure it is at the “kneading setting” and you are using a dough hook. 6 minutes on this setting worked well for me. Either way, you want to continue kneading until the dough is smooth and elastic. 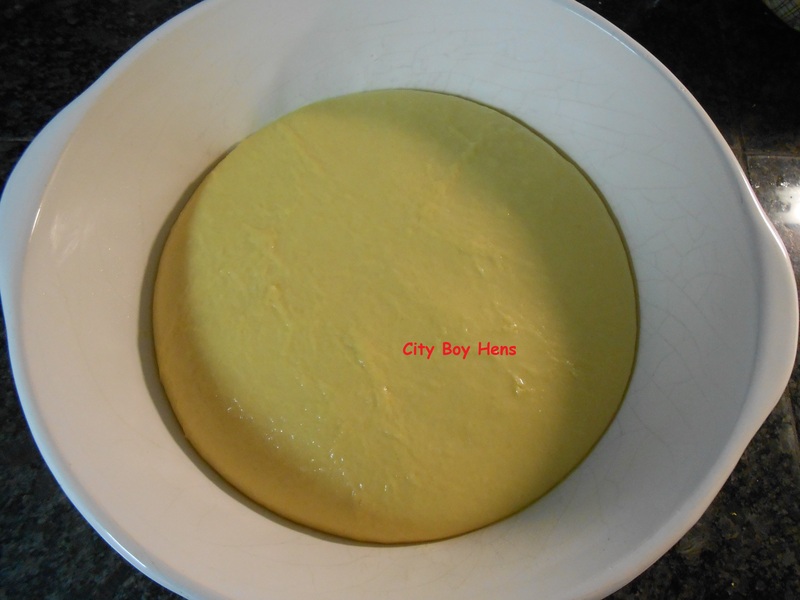 2 hours later, the dough should have doubled in size and look like the picture below. While the dough is rising, take a few minutes to get your raisins plumped up in the Amaretto. I combined the raisins and the Amaretto in a small covered sauce pan on low heat for a few minutes and then set it aside. 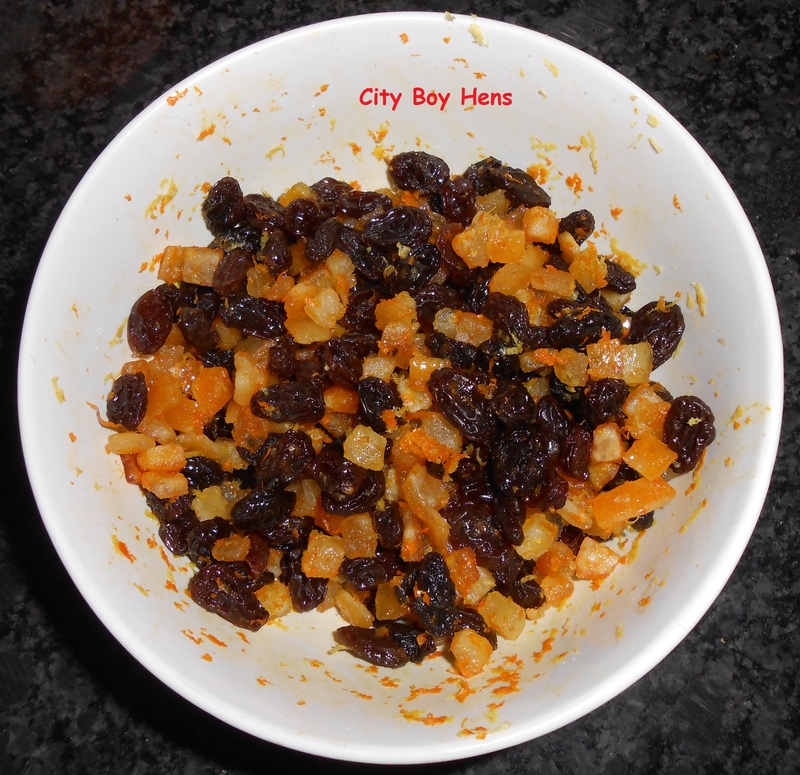 Once cooled, combine the raisins, citrus peel and zest. Once the dough has doubled in size, turn it out on to a lightly floured surface and “punch” it down. You want to get the air out of the dough. Next, pat the dough out and add the fruit to the middle. Begin gently kneading until the fruit is evenly distributed throughout the dough ( a few minutes). 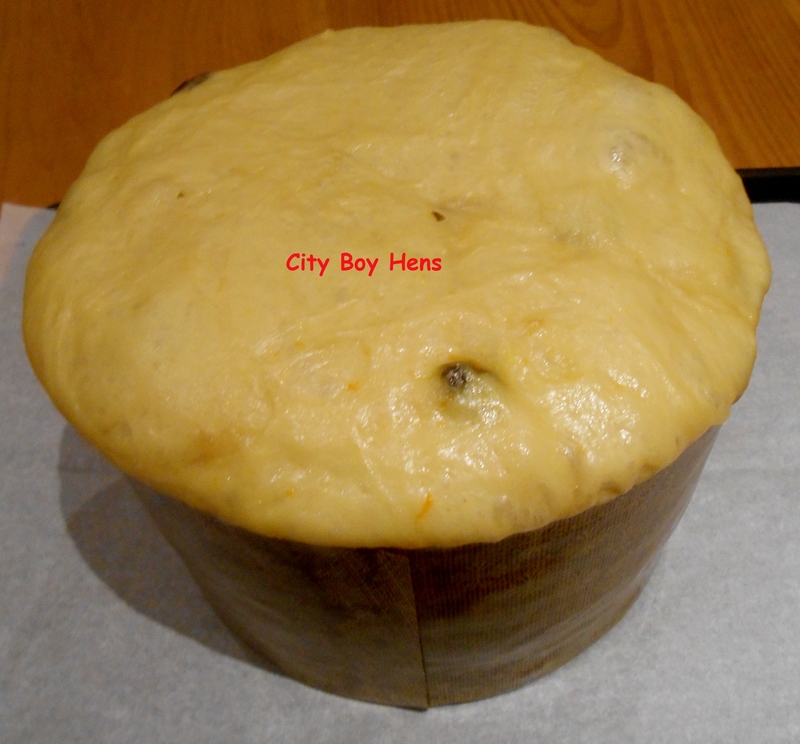 Form the dough into a ball and place it into a Panettone mold or greased pan. Cover once again and let it rise in a warm spot until doubled in size (around 2 hours). After 2 hours, it should look like the following picture. Brush the top of the Panettone with melted butter. 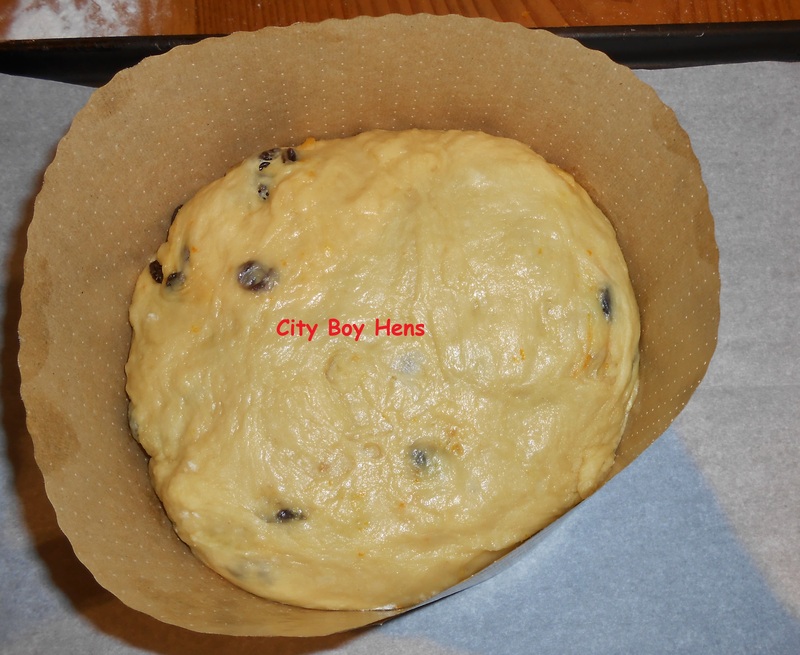 If you are using a Panettone mold, make sure to place it on a cookie sheet that is lined with parchment paper. Place the Panettone in the oven and set the timer for 10 minutes. After 10 minutes, reduce the heat to 350 degrees F. and continue to bake for 40 more minutes. If the top begins to brown too quickly during the bake, then place a piece of aluminum foil over the top of the bread for the duration of the bake. At 50 minutes, remove the Panettone from the oven and “test” that it is done by inserting a long wooden skewer (the kind you’ll use for shish kabobs) into the center of the cake. If it comes out clean, you are done. If not, put it back in the oven for another few more minutes and “test” again. Place Panettone on a wire cooling rack. If you are using a pan, let it rest on the rack for 10 minutes before removing the Panettone. HI! Fun to read this. 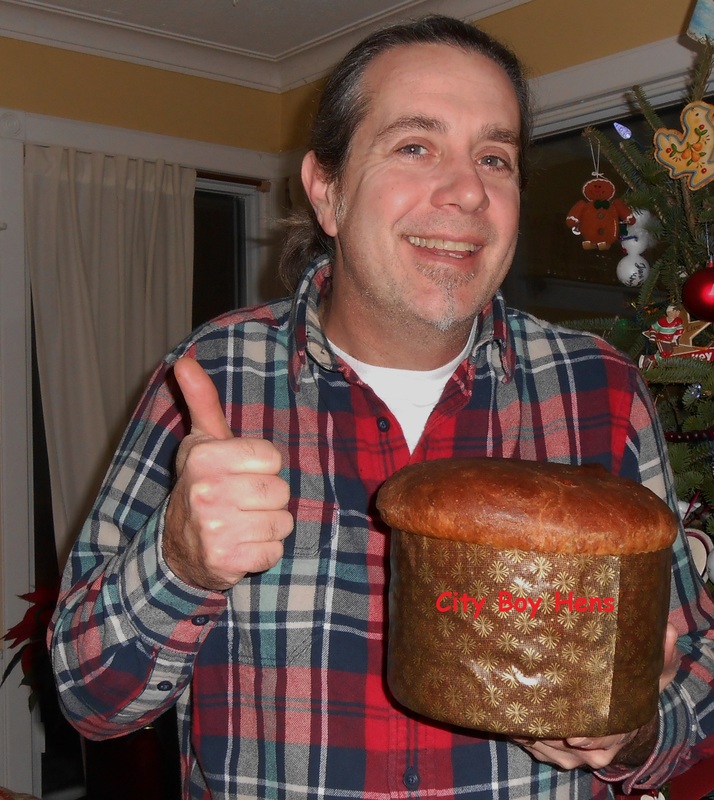 I have made Panettone off and on throughout the years, it is my all time favorite. It is so delicious. I was not going to make it this year, but now you have inspired me, so I might just have to do it. Happy holidays! I have been buying my panettone for years, it’s a Christmas tradition. I have thought about making my own, the one thing thats held me back is the panettone mood, I’ve never seen one, any suggestions where I can purchase one, theres still time for this year. The raisins in Amaretto sound good. Buon Natale to you as well! You may be able to get one at a specialty bake shop. That is where I buy mine. But you can also get by with a “panettone size” everyday pot (metal handle) that is lined and “built up” with parchment paper. If that doesn’t work, there are lots of resources on the Internet that use a coffee can. I hope you give it a try. 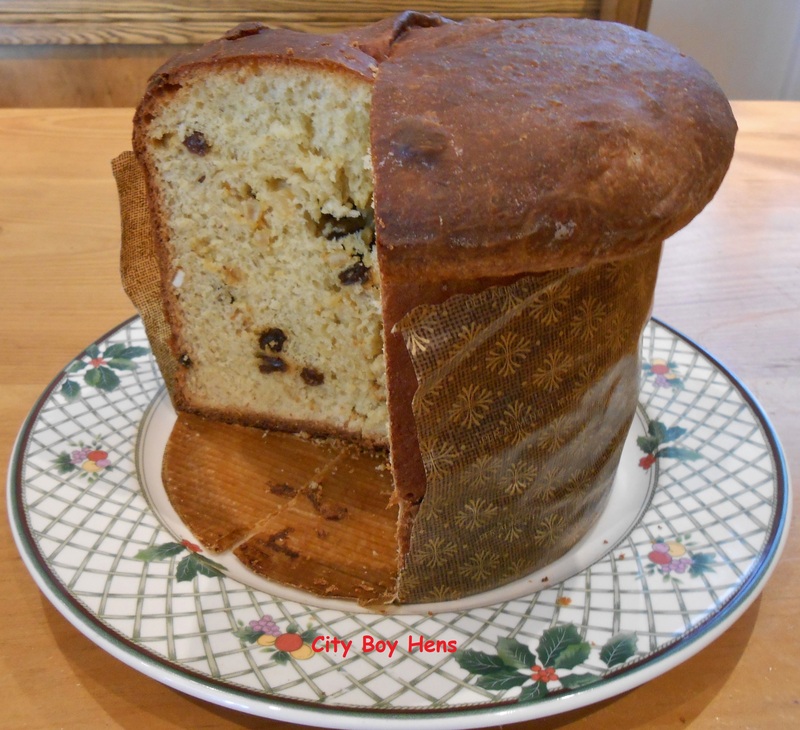 Great recipe, Panettone is a tradition in my family around christmas. I had to fashion a mold out of parchment paper myself to try this out, but it expanded out the bottom so I had to transfer it to a pan, but it worked just as well. I used rum instead of Amaretto with the raisins, and used chopped up dried pineapple and mango instead of the peels. The crumb was perfect, but next time around I would try adding some honey, more sugar, or malt extract to sweeten it just a bit more. Definitely keeping this recipe in my holiday baking repertoire. Thanks!